Step 1. 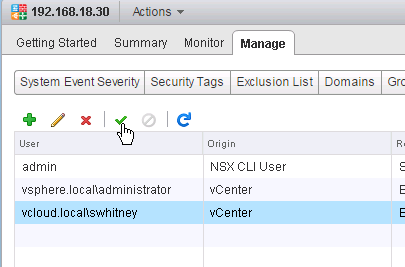 Log into the vSphere Web Client and navigate to Networking & Security -> NSX Managers and double click on the NSX Manager in which you would like to manage user accounts. From there, select the Manage -> Users tab. Step 3. 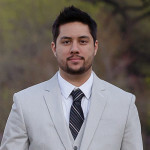 Specify the Role that you would like for this user account, then hit Finish. I have copied and pasted the descriptions from the GUI below. Auditor: Users in this role can only view system settings and auditing, events and reporting information and will not be able to make any configuration change. Security Administrator: Users in this role can configure security compliance policies in addition to viewing the reporting and auditing information in the system. 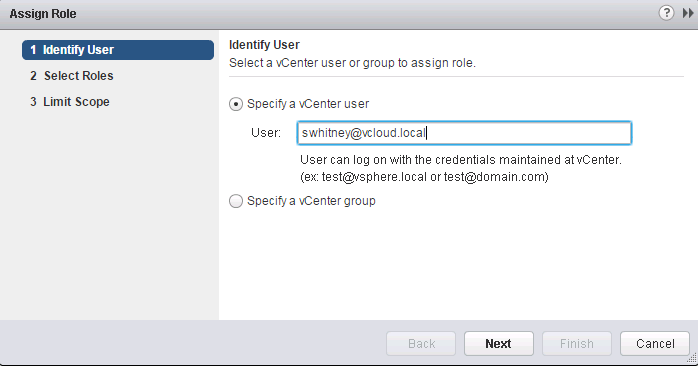 NSX Administrator: Users in this role can perform all tasks related to deployment and administration of this NSX Manager instance. Enterprise Administrator: Users in this role can perform all tasks related to deployment and configuration of NSX products and administration of this NSX Manager instance. Step 4. To edit a user role, simply highlight the user account and click the pencil icon show below, and make any required changes. Step 5. To delete a user account, highlight the user and click the Red X icon show below. Step 6. To disable a user account, highlight the user and click the Red Circle icon show below. Step 7. Finally, to enable a user account, highlight the user, then click the Green Check icon shown below. 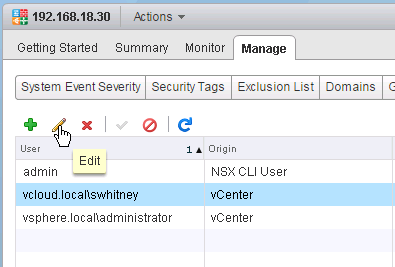 After you configure the lookup service configuration, you can add a role with your domain user and log into NSX manager, yes. 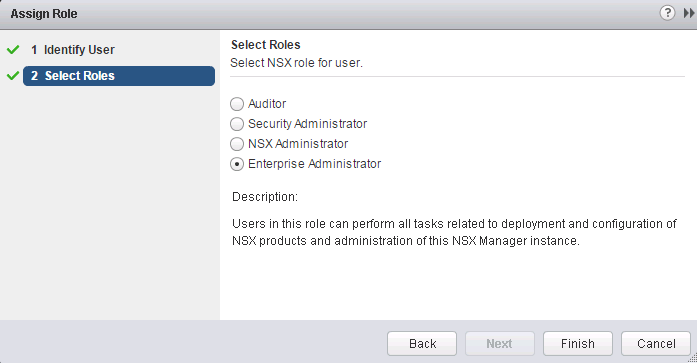 I could not get the exact difference between NSX Administrator & Enterprise Administrator role. Could you please explain the difference with an example ? 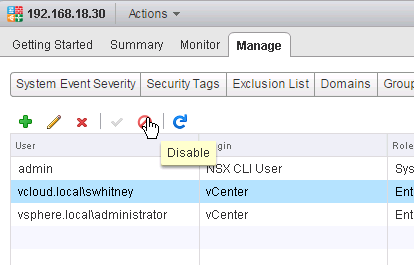 For NSX Edge Gateway devcies , it uses the same password for basic & privilege modes. Is there any way we can have separate password for basic & privilege modes. 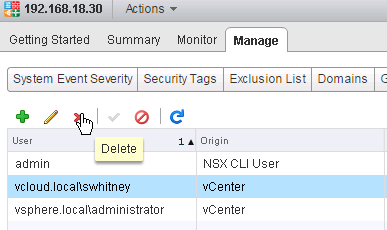 For NSX Manager I know it is possible. 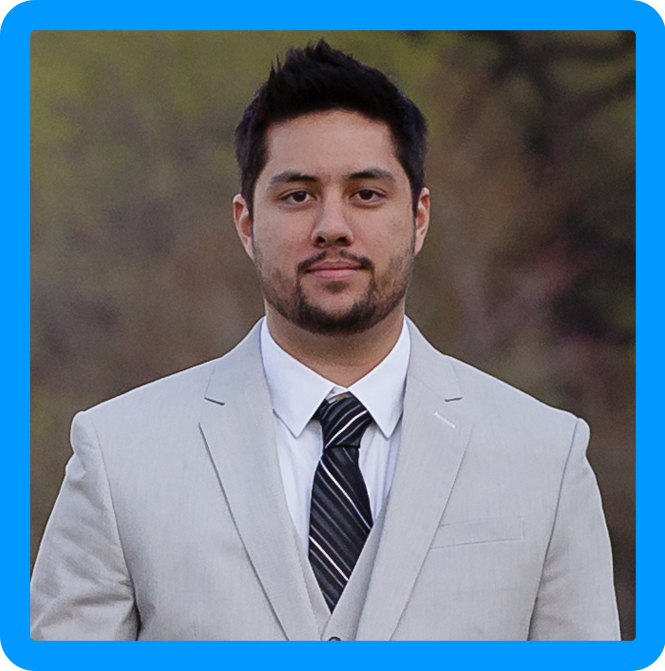 Is it possible for Edge & Controller VM. Hi! Sean the step 7 i believe it is to enable the disabled user instead rename.